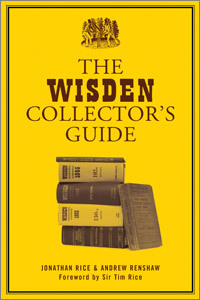 Cricket is such a widely written about sport that many, many subjects within the sport are covered and now we have The Wisden Collector’s Guide which gives advice on book collecting. Having been collecting cricket books and made a decent collection myself, I was intrigued to read this book and found it fascinating. It concentrates naturally enough on collecting Wisden Almanacks and gives a double page review of every edition since its inception in 1864. Each feature covers the highlights of that cricketing year as seen through the pages of Wisden and lists Notes by the Editor, Feature Articles, the Five Cricketers of the Year, Obituaries and County Review in addition to world events which happened during that year. The idea is to whet the appetite of readers who may wish to acquire a particular Wisden by drawing attention to that year’s contents whilst also helping how to acquire and protect readers’ existing copies. There is a mine of information within this book: not only the contents of each Almanack but a history of Wisden which includes printers, owners since 1985, compilers and editors, print runs and much other information about the “Cricketer’s Bible”. Also covered is the edition of Wisden Australia which only lasted for eight years and also very useful sections on the main cricket book sellers, auctioneers and websites where not only Wisdens can be obtained. Guide prices are also mentioned and, all in all, this is an exhilarating book for all collectors and would-be collectors. Sir Tim Rice, lucky man, has written an excellent Foreword in which he mentions that one of his best purchases was a full set of Wisdens in 1973 for £750. The envy of many and a very sound investment with estimates for a full set reaching these days to something around £120,000 through auctions. Sadly, for this reviewer, there is no section on how to find the money to acquiare a full set and, my appetite whetted by this excellent book, I still sleep easily at night knowing that my collection which goes back until the mid-1970s, will not increase quickly but, for more ambitious collectors, this is a tremendous book.